Today I am writing about one of my favorite appetizers, Escargot. I love the delicious flavors of the garlic, butter, and the escargot. I also love dipping my bread in the garlic butter, after I have finished eating the escargot. Mix butter, garlic, parsley, wine, salt, and pepper. Spoon a small amount of the butter mixture into each snail shell. Next put a snail inside each shell. Then add the rest of the butter mixture to each of the shells. Bake for 12 to 17 minutes. Butter should be melted. Serve immediately with fresh french baguettes, to soak up garlic butter. 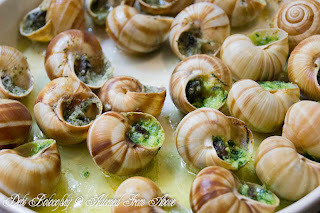 I hope that you enjoy today's recipe for Escargot. As usual I always love hearing from you. I've never cooked these, but would love to try. Your recipe made it seem easy. An elegant appetizer. It has been a crazy week. Just moved and got internet today. I'll be over in a minute to share. I love escargot- we live in the midwest, not sure where to buy it- popped over from whatcha workup. I'll admit, I will probably never try escargot, but your recipe looks great. Thanks for sharing at One Creative Weekend! My husband wont eat them either, but the garlic butter tastes delicious. I dunk my bread in it.